The Catholic Church now has 35 Doctors of the Church. These are Saints whose writings and doctrine are of great benefit to the whole Church. They are known for the depth of their understanding and the orthodoxy of their theological teaching, and they have contributed significantly in at least one area of Catholic faith. For example, St. Basil the Great is known for his support of the Nicene Creed in opposition of Arianism, and is also considered by many to be instrumental in the growth of communal monasticism. On October 7, 2012, Pope Benedict XVI gave to the Church her fourth woman Doctor. St. Hildegard of Bingen. joins the ranks of St. Catherine of Sienna, St. Teresa of Avila, and St. Therese of Lisieux. St. Hildegard, who lived in the twelfth century, was declared a saint by a process of ‘equivalent canonization’ in May of this year, which extended her liturgical cult to the whole of the Church and made it possible for her to be named a Doctor of the Church. She was a writer, composer, philosopher, mystic, Benedictine, visionary, and contributed a great deal to the science of herbal medicine. She received many visions from childhood on, and as she wrote them down, she explained them with biblical exegesis - of all her accomplishments, this especially made her a remarkable woman in her time. Unfortunately, St. Hildegard has been adopted by feminists and new age devotees alike. If you are interested in learning more about this remarkable woman, choose your sources very carefully. 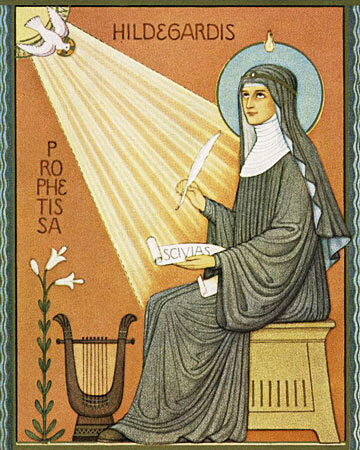 For more information about St. Hildegard, the Catholic Encyclopaedia at New Advent is a good place to begin. Thanks for the write up on St. Hildegard. I have studied the saints for years, they are incredible men and women, but I don't know much about St. Hildegard at all. I heard about the new Doctor of the Church, but had not had a chance to look her up. Her life is fascinating.... it is too bad that the 'feminists and new age devotees' have adopted her, but maybe it will bring them to Christ. One of my favourite quotes from the saints (I cannot remember who, sorry) is that: "to be a witness does not consist of engaging in propaganda or even in stirring people up, but in being a living mystery. It means to live one's life in such a way that one's life would not make sense if God did not exist." She led her life as a witness to God's glory and the Truth and if these people try to understand her they will eventually come there themselves.